Tanisha Thompson (pictured below, right) had been working in the nonprofit sector for over ten years when she realized the world around her was changing. She works in marketing and says she noticed that relying on data to make decisions was and is becoming more and more integral to the way she does her job. Tanisha toyed with the idea of doing an MBA when she came across the online MS in analytics program at American University’s Kogod School of Business. It was more relevant, she explains, to her experience. Tanisha started the online analytics program in 2016. This year she was in the first round of students to work on an innovative new project with the globally-recognized nonprofit group, Special Olympics International (SOI). Special Olympics International (SOI) is an organization committed to providing sports training and athletic competition to children and adults with intellectual disabilities. The organization also holds sporting competitions globally, including an alternative Olympics World Games event every two years, for athletes with intellectual disabilities. 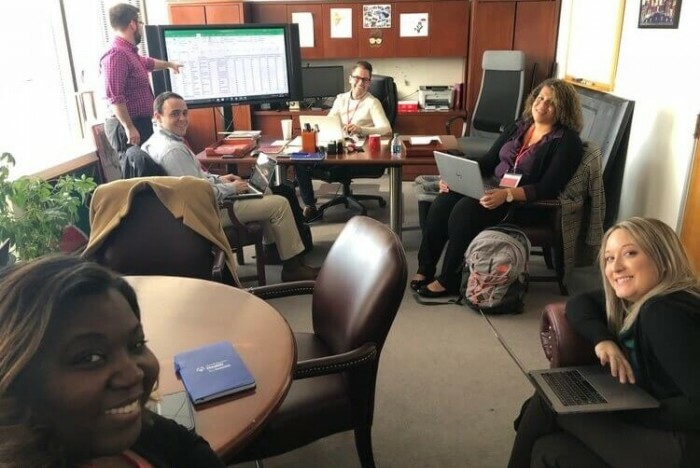 For the first time in SOI’s history, students in the MS in analytics program are being given access to datasets from the organization, using their capstone project to analyze SOI's datasets and provide predictive analytical models for the organization. "I believe that you can use data not just for profit but for social change." For Tanisha, the partnership has helped her and her colleagues in the program see the benefits of data analytics skills first-hand. Tanisha, who works for the Salvation Army, believes that increased connection between business students and the nonprofit world can be hugely beneficial for both parties. Tanisha adds that managing her role with The Salvation Army alongside her degree has been challenging. But, she is now able to apply a lot of what she is learning on a daily basis. “My analyzing of data—and how I see the data that I use daily—is different now, and that’s because of the MS Analytics program at Kogod School of Business,” she explains. Derrick Cogburn, executive director of the America University’s Institute on Disability and Public Policy (IDPP), adds that the Healthy Athletes System—the database used by SOI—has become the largest dataset in the world on the health of persons with intellectual disabilities. The partnership between American University’s Kogod School of Business and Special Olympics International also extends beyond the business school, into a “broader and deeper collaboration with SOI across campus,” Derrick says.